*Don’t miss the invitation at the end of this post. Start your year out with the online Holy in the Moment Book Club! Coming soon! Have you considered the value of clarity in what God has been teaching you? When you are refreshed and mentally focused, we can fully enter into the new things God will do in your life. There’s something cathartic about January, this first month of the new year. Think about the reasons we make resolutions for new growth and clean out closets this time of year. If our physical lives need to set goals and clear the clutter, how much more to we need to mentally and spiritually prepare our hearts for the days to come? One of the ways I transition from one year to the next is to review the lessons learned and the truths I’ve embraced. I usually end the year in such a frazzle, that it takes me a few weeks to dig myself out of the physical and mental busyness that seems to explode in my home during December. You too? For me, this past year was a milestone year–exciting and extremely busy, filled with blessings I am deeply grateful for. At the end of the year I felt like I was sprinting to the finish line trying to cram too much into the end the year. I was mentally and spiritual depleted. The last thing I wanted to do was think about dragging all my unfinished tasks into a new year, feeling behind before it even began. Maybe you have felt that way too. I needed time to refocus and recharge. Reviewing what I learned from God gave my soul time to catch up with my life. It gave me fresh faith to start this year with a fresh perspective. To be honest, this girl had to take a step back for some rest and a deep dive with God. I wrote myself a permission slip to dial back the crazy and enter this new year slowly. I needed time for my soul to catch up with my busy and time to prepare my heart what’s next. I call it a Soul Sabbath for my year and all I need is time, my Bible, and my journal from the past year. Other years, I’ve spread it over several days for 30-60 minutes a day. Sometimes I do this is December, sometimes I review in January. I also review whenever I finish a Bible study or finish a journal/notebook. Do what works for you, however you can carve time to refresh and refocus with God at the end or the beginning of the year. Just do it! Try This: Schedule time to review with God. Write a permission slip for your soul. What will work best for you? A long block of time or reviewing during your normal devotional time? Journaling is one the ways I record and process what God is teaching me each day. It is a way to give God my attention and process what the Holy Spirit is teaching me as I read the Bible. According to a recent article from Lifeway on trends in women’s ministry, there is a renewed interest in reading the Bible and journaling. The holy habit of reviewing the lessons God has taught me in the past year refreshes my spirit as I remember the many ways God has been faithful. Listening to God through reflective Bible reading helps us to grow closer to God. I prayerfully look back over my journal, looking for the big picture and main themes of what I’ve been learning as I read and meditate on the Bible throughout the year. We all need time to recognize and celebrate the big picture of what God has taught. My thirsty soul needs time to soak up the goodness of God and understand a clearer vision of His heart for my next steps. What we learn today prepares us for the road ahead. It is also a time to simply rest as I lay aside all the doing and scurrying, my heart ready to be filled anew with the refreshing presence of the Holy Spirit. Try This: Write a topic at the top of each entry in your journal. This way you can quickly track trends in concepts. As you pray, ask God these questions. Reflect as you think through the questions. What verses came up several times in my journal? How did God speak to my challenges through reading His word this year? What was the over-all tone of the year spiritually? Was is it a season of struggling, strengthening, preparing, serving, or flourishing? Am I more or less grateful than last year? What seems to be the most important things God has taught me this year? How can I apply these lessons in the coming months? On the pages of my journal, I begin to see the broad strokes of what God has been teaching me in the day to day. I’ve developed more helpful strategies for my devotional time. If you’d like to learn more about how I do this, leave a comment at the end of this post. The only way to prevent God’s word from getting crowded out in the thorns of our busyness, the thistles of our cares, and the weeds of our wayward hearts is to give time, attention, and intention to prepare our souls to fully receive God’s word (seeds). There is great value of doing this through regularly reading and studying God’s word. Recording what we learn empowers us to remember and review, which fosters faithfulness and growth. Seeking to be faithful with our moments and days is part of creating a lifetime of holy moments. Giving God our time and attention is a vital way of tilling the soil of our hearts for Him to multiply the fruit of His word in our lives. Using your journal to review what you have learned is powerful, whether it is at the end of the week, month, or year–or even the end of a Bible study. This takes time. I’ll be honest. But it is time that is so very worth it! Reviewing what God has taught me has become one of my favorite ways to spend time with God. It also is a powerful maximizer for spiritual growth. I’ve also seen how this practice has accelerated spiritual growth and nourished my writing and speaking. I realize this isn’t a popular concept in the frantic pace of today’s world where busy is the new holy and productivity is often confused with maturity. When we give God our time, attention, and obedience, He does great things in and through us. It begins with preparing your heart and giving God your attention. Greater clarity and deeper time with God will give direction and ignite growth. When we are aware of what God is teaching us, we can join Him in the moment by making intentional choices to apply what we’ve learned. Click here to download a printable version of this infographic. Application of God’s wisdom is where transformation and growth happens as spiritual meets the practical in our lives. ““He who is faithful in a very little thing is faithful also in much. . .” (Luke 16:10). Though the context of this verse refers to money, the principle also applies to the value of what God teaches us in the moments and days of each year. Spiritual preparation paves the way for intentions evolve into habits. Knowing + Doing = Blessing! 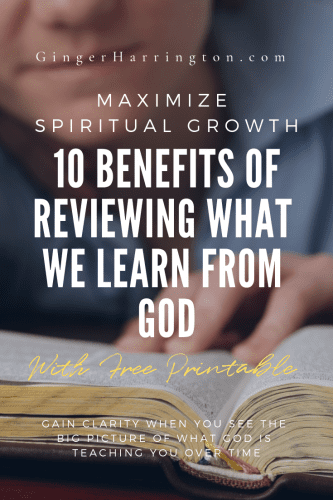 Maximize spiritual growth when God-lessons become spiritual goals. Being faithful to grow in what God is teaching will prepare you to receive God’s fresh blessings in the days to come. How do you apply what God is teaching you? Introducing the Holy in the Moment Online Book Club! You’re invited to join me for an Online Book Club for Holy in the Moment to make the most of your moments this year! Today is your time to unleash the power of small changes, daily choices, and the gift of holiness wrapped in each day. Discover biblical insights, engaging stories, simple reminders, and practical steps to spiritual growth that will help you overcome challenges and be more purposeful. Click the image below to learn more. Discussion questions, printable graphics, and activities will be delivered to your inbox. Engage with Ginger and other readers in a private FB group. Click the image below to learn more and to sign up. New Year, SPIRITUAL GROWTH. Bookmark. It sounds like we have very similar ways to end/start a year! I keep a journal and I can’t imagine the end of the year without reviewing and closing out the journal and then starting the new one. I think it’s my favorite time of year! It’s such a great time of remembering all God has done and what I’m giving to Him in the new year. Lovely affirming and inspiring post! I’m so glad you enjoyed this post. It is amazing to look back over the year and get the big view of what God has taught in the day-to-day! Many blessings for a wonderful 2019! Thanks for visiting today, Amy! Review is often the step I don’t take, so thanks for this reminder, Ginger. I know it is an important part of our growth! Hi Lisa! So glad you could join in the conversation. 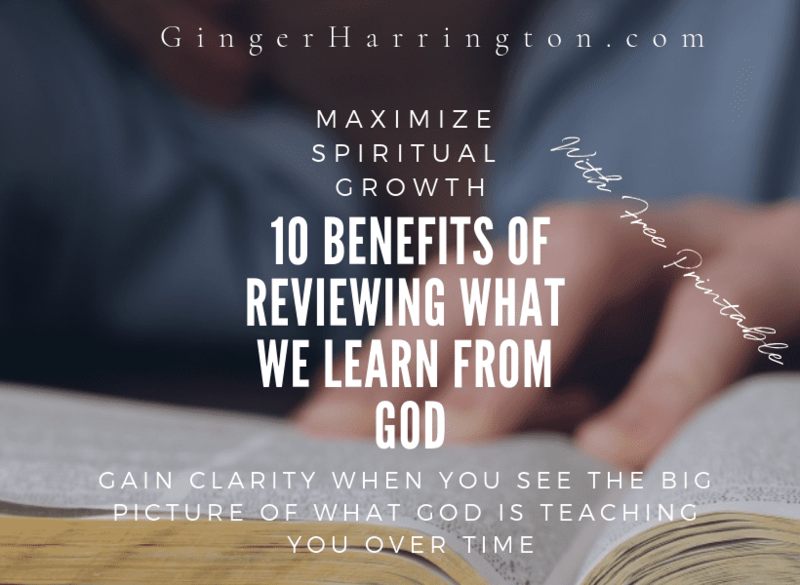 It does take time, but when you see what God reveals through reviewing, it quickly becomes something to look forward to! I love this reminder to take time to review – I think a lot about it but I rarely do it!! I will change that this year. I also love the tip to write words, themes or topics at the top of your journal or Bible study to look for what God is repeating and drawing attention to! That one simple thing makes a big difference. I love the way you post what you are grateful for each day on FB. So often, what you are learning is part of your post. You’re strategy is also another way of hanging on to what God teaches us–sharing it with others!